* All their classic hits plus 2 new Cure songs! * Exclusive bonus "Cure Hits Unplugged" CD with first pressing!!! 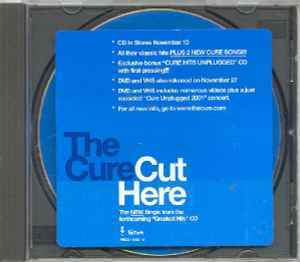 * DVD and VHS includes numerous videos plus a just recorded "Cure Unplugged 2001" concert. ℗ © 2001 Elektra Entertainment Group Inc. for the U.S. and WEA International Inc. for Canada, Warner Music Group, an AOL Time Warner Company. Limited edition. Promotional Copy Not For Sale. Blue label CD, released in "W" (Warner logo) back embossed jewel case with back tray and big front sticker.